The United States Congress designated the San Gorgonio Wilderness (map) in 1964 and it now has a total of 104,389 acres. All of this wilderness is located in California and is managed by the Bureau of Land Management and the Forest Service. San Gorgonio Mountain was originally known as "Old Grayback" by locals until officially designated by the US Geological Survey (from the Spanish heritage) on the original topographical map of the area produced in 1899. At 11,502 feet, it is the highest peak in California south of the Sierras. 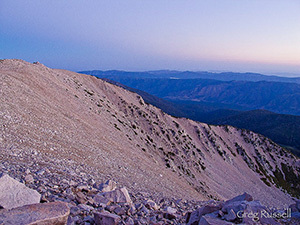 The San Gorgonio Wilderness derived its name from this peak within its boundaries. The Wilderness is located in the southeast portion of the San Bernardino Mountains on lands administered by the San Bernardino National Forest and the Bureau of Land Management. Most of the Wilderness is above the 7,000 foot level. Two rivers (which would be called creeks anywhere but in Southern California), the Santa Ana and the White, flow out of the Wilderness. The numerous streams in the Wilderness Area do not always flow in late summer, and locating water can be difficult. Two small lakes, several meadows, and large, heavily forested areas provide a beautiful sub-alpine oasis in the dry lands that surround the mountain range. The isolated environment contains many threatened and endangered plant and animal species, as well as bear, deer, mountain lions and bighorn sheep. The summit of the 10,624-foot San Bernardino Peak provided the initial point in 1852 from which all of Southern California was surveyed. There are 81 miles of trails in the National Forest portion of the Wilderness, and approximately 20 miles of the Pacific Crest National Scenic Trail in the Bureau of Land Management portion. Planning to Visit the San Gorgonio Wilderness? How to follow the seven standard Leave No Trace principles differs in different parts of the country (desert vs. Rocky Mountains). Click on any of the principles listed below to learn more about how they apply in the San Gorgonio Wilderness.